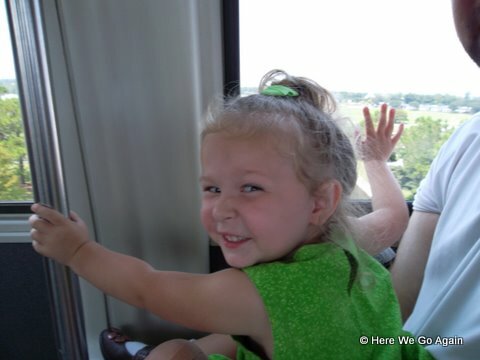 Today, Elizabeth met the fairies.Â We started on the monorail, or as Elizabeth calls it, “the flying train.”Â She likes the flying train. 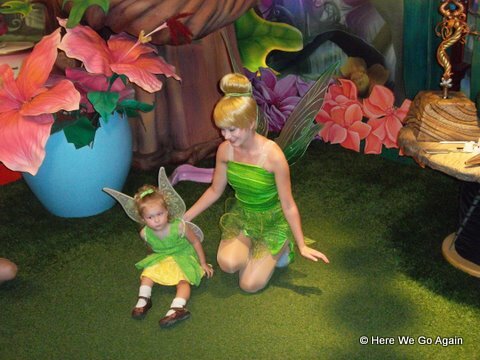 Then we waited in line for a whole hour to meet the fairies in Pixie Hollow.Â They have Tinkerbell and one of the other fairies.Â We got Vidia.Â Vidia is one of Elizabeth’s favorites. 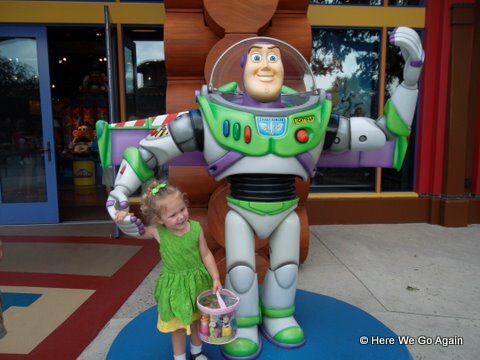 Elizabeth then spent the next eight hours admiring her arm with the pixie dust on it. 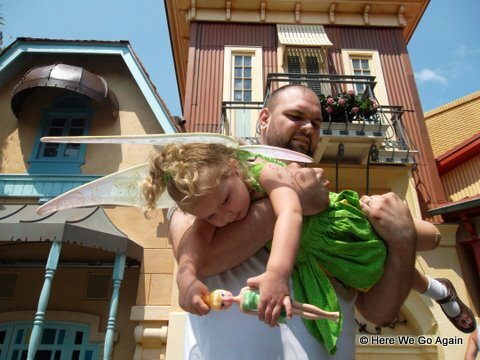 After leaving Pixie Hollow, Elizabeth insisted that she could fly.Â Luckily, she has a very accommodating daddy. 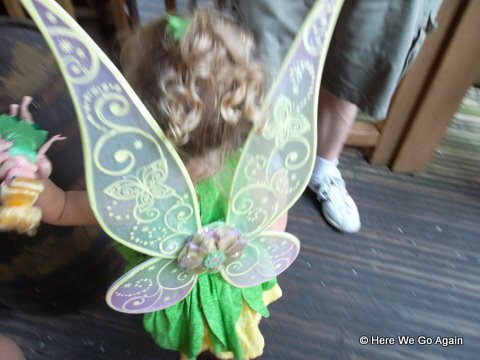 Elizabeth has been insisting for at least a month that when she met Tinkerbell at Disney World, Tinkerbell would give Elizabeth some wings and then Elizabeth would be able to fly.Â We bought some wings and brought them with us.Â (And they were seriously a pain for me to avoid squishing in the car with all the luggage and the stroller for this whole week. 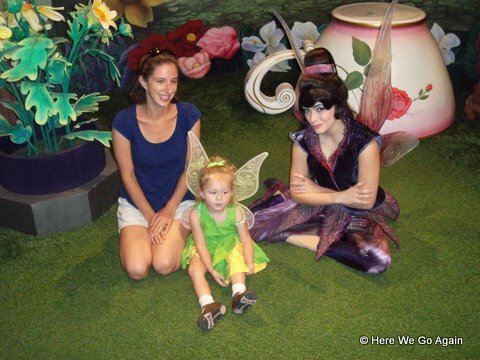 )Â We took them with us and right before we went in to meet Tinkerbell, I asked if Tinkerbell could give them to Elizabeth.Â The man said yes and took them in.Â Then he came back and said actually, no, she couldn’t.Â (Which I thought there were pretty good odds of, I mean, all the other kids would be seriously jealous. 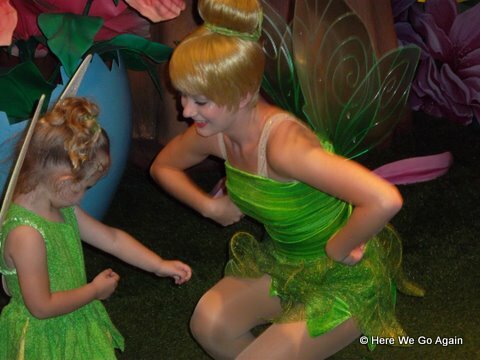 )Â So we gave them to her right before and told her that Tinkerbell gave them to us to give to her and put them on her.Â She wore them to meet Tinkerbell and showed her them. 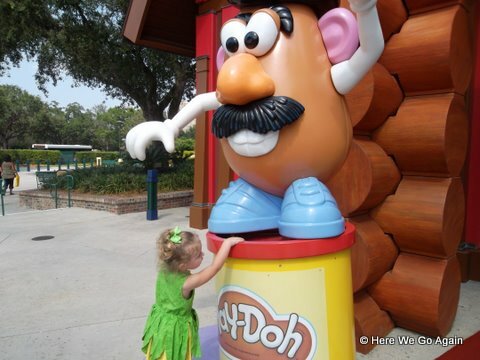 And talked her daddy into lots of toys.Â We are going to have trouble fitting them in the car on the way home.